Starting today, Central Square Boutique is blowing out the "kids section"! All Cranium, Webkinz, Scratch Magic, Magnetic Boards, Puzzles and baby items are 40% off to make room for all the awesome fall fashions coming in daily. While you are in the store check out all the new beautiful fall fashions and mention you saw Central Square Boutique on Around the Common and get 20% of any fall item. Get rid of your unused electronics to make space in your house at an E-Cycling Fundraiser. The fundraiser is sponsored by the Friends of the Bridgewater Public Library and will benefit the Bridgewater Public Library. For list of acceptable items and pricing please log into the library's website by clicking here. 6. Items Requiring Board Action: (a) Design Review Board Appointments (b) Treasurer/Collector Clerical Posting (c) Town Buildings Committee Recommended Architect. The Bridgewater Academy Lions are sponsoring a giant tag sale tomorrow (September 26) at the Winter Place parking lot on the corner of Winter Street and Route 18. The tag sale will take place from 7AM to 11AM and all proceeds from the event will benefit the Bridgewater Academy Lions Club Charities. The Bridgewater Community Lions are seeking crafters for the Bridgewater Community Lions Club Arts Festival which will be held on November 14th at the Bridgewater Middle School. For vendor information, please call Lion Joyce Middleton at 508.697.0041 or email joyce.middleton@verizon.net. Retail vendors such as Pampered Chef, Silpada & Tastefully Simple will respectfully not be accepted. The Friends of the Bridgewater Public Library will sponsor a book sale this Saturday, September 26th. 10am-noon open to general public. Details: Name Your Own Price. The Bridgewater Garden Club will meet tomorrow, Wednesday September 23, 2009 at the Cole Yeaton Senior Center at 1 p.m. Kathy Gariepy, a master gardener, will discuss the "Perennial Bulb Gardens." For more information please call 508-697-7827. Join any of the Bridgewater Dunkin' Donuts this week and get "Purple with a Purpose," as Dunkin' Donuts seeks to raise Alzheimer's awareness with a tasty treat. Beginning on World Alzheimer's Day (Monday, September 21st) 178 Dunkin' Donuts stores in our region will be offering a special "Purple with a Purpose" donut. 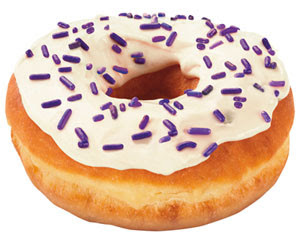 Each of the Dunkin' Donuts here in Bridgewater will be featuring the Purple with a Purpose donut! Dunkin' Donuts participating stores also will have HELPLINE flyers and Alzheimer's Association pamphlets on-hand for customers. Around the Common is pleased to announce that we are now on Facebook. Please log in today to become a fan of Around the Common. To see our Facebook page, please click here. The Strength Studio is coming to Bridgewater! The Strength Studio is designed to provide WOMEN with the ultimate group fitness experience. We will motivate you to achieve your goals through our high energy classes and the most qualified instructors. We believe that with a strong body comes a strong mind! Our programs include: Zumba, Yoga, BodyPump, Cycling, Step It Up!, Boot Camp, Kick Boxing and more! STOP BY & CHECK OUT OUR NEW STUDIO! MEET SOME OF OUR AMAZING INSTRUCTORS!! SEE SOME CLASS DEMONSTRATIONS AND HEAR MORE ABOUT WHAT WE HAVE TO OFFER. DON'T WAIT -- GET A GREAT RATE! TO GET INTRODUCTORY PRICES YOU MUST REGISTER BY OCTOBER 3RD. If you can't make it to the party, but are interested in getting the discounted pricing please call, email us or visit our website! There will be Music Together Class for the kids and face painting in our KidCare Room! The Christopher G. Stone Foundation battling ALS will take place on October 3rd at the Knights of Columbus on Bedford Street here in Bridgewater. The event will begin at 7PM. Tickets can be purchased in advance for $25 or at the door for $30. Included is an Italian dinner, raffles, auctions and live DJ music. For more information, please contact Rebecca Stone-Corndell at rebecca_corndell@hotmail.com or 508.989.9270. Tickets can be purchased by contacting Rebecca and raffle or auction prizes can be arranged to be donated. Around the Common would like to welcome Silva Engineering Associates, P.C. to our business listings. Please make sure that you support the local economy by utilizing local Bridgewater businesses such as Silva Engineering Associates, P.C. Silva Engineering Associates, P.C. (SEA) was established in 1988, with the goal of providing a broad range of civil engineering and land survey services in a personal, professional and efficient manner. SEA’s focus has been to assemble a small group of dedicated professionals pragmatic in approach and with specific and diversified experience to meet the needs of our various clients. Lawrence P. Silva, PE, founder of SEA is involved in all projects applying nearly 30 years of experience upon which clients rely. SEA remains determined to provide a superior level of professional quality and service. This approach has resulted in continuing relationships with a loyal client base. Referrals are our marketing mainstay, the true measure of a job well done accounting for the majority of SEA’s business. Over the past twenty years, SEA has completed a number of engineering evaluations, field surveys and engineering designs for projects within the Bridgewater State College Campus. On occasion, BSC has utilized SEA to oversee construction of the work that has been designed by SEA and others. We currently have a significant portion of the campus surveyed and maintain a database of information relative to site utilities along with other survey information. SEA has a diversified clientele throughout Massachusetts which include individuals, municipalities, developers, attorneys, large corporations and state/federal agencies. SEA responds to the specific needs of our clients in a timely manner, producing plans and reports of the highest quality. The Bridgewater Water & Sewer Department will conduct hydrant flushing through September 17th. The hydrants that will be flushed will begin at High Street and go toward Plain Street, Bridge Street, Hayward Street, Whitman Street and Plymouth Street along with streets that come off of these roads. Please call the Bridgewater Water & Sewer Department with any additional questions at 508.697.0910. The results are in an are rather significant amount of Around the Common readers agree that the move by the Board of Health and Board of Selectmen to immediately fill the vacancy on the Board of Health with resident Brian Penney was the right thing to do. Though there was some opposition to the matter it does seem as though the majority feels as though there is major work that needs to be done by the Board of Health (such as at the transfer station) and that leaving a vacancy on the Board of Health would have been an irresponsible action to take. Please click the flyer for a larger version. 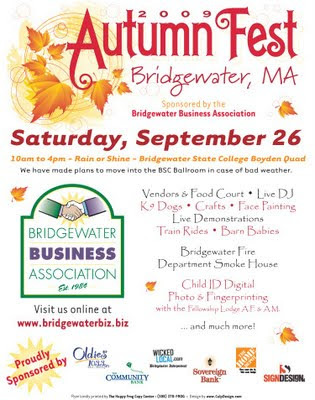 For more information about Bridgewater's Autumnfest, please click here. The SAILS Network will host the Digital Bookmobile, an immersive download experience inside a 74-foot high tech trailer, on September 19th from 10 a.m. to 4 p.m. at the Lakeville Public Library. As members of the SAILS Network, Bridgewater residents are invited to participate. The Digital Bookmobile is housed inside an 18-wheel tractor-trailer. This community outreach vehicle is a high-tech update on the traditional bookmobile that has served communities for decades. It is equipped with broadband internet-connected PCs, high definition monitors, premium sound systems, and a variety of portable media players, all of which help visitors explore the Bridgewater Public Library's download service. Interactive learning stations give visitors an opportunity to search the library's digital media collection, use supported mobile devices, and sample ebooks, audiobooks, and music. The Digital Bookmobile is a service of SAILS Library Network and is operated by Overdrive, Inc. For more information click here. SAILS is a member-driven and funded organization, supporting libraries throughout Southeastern Massachusetts. Pursuant to the provisions of Chapter 40, Section 56 of the Massachusetts General Laws, as amended, the Board of Selectmen will hold a public hearing on Tuesday, September 15th at 6:45 p.m. in the Selectmen's office located in the Memorial Building at 25 South Street. The meeting is scheduled to consider Local Tax Property Policy (Classification), spefically, the issue of allocating the local property tax levy amongst five property classes: Residential, Open Space, Commercial, Industrial and Personal Property for the fiscal year 2010 shall be determined. Interested parties are invited to present and to be heard. Did you know that you need not simply rely on National Grid to provide your electricity service here in Bridgewater? For about 3 months now we have been using Easy Energy, which is a Massachusetts company, for our electric service. Through an agreement with National Grid, you will still receive one bill and will make your payment to National Grid since they still handle the transmission of your electricity but Easy Energy handles the purchasing of the electricity off of the grid to deliver to your home. All you need to do is call Easy Energy and they handle the rest for you. You will need your National Grid account number handy. For more information, please log into Easy Energy's website by clicking here. This Week's Poll: Should the Vacancy on the Board of Health Been Filled? If you missed last night's contentious Board of Selectmen meeting, a majority of the Board of Selectmen along with the Board of Health voted to fill the vacancy on the Board of Health by appointing Brian Penney to the position. Some residents and Board members felt as though there was no need to fill the position and that the town should wait until the April elections to address the vacancy while proponents of the appointment argued that a two person Board of Health could result in gridlock and given the issues at the transfer station an appointment was of immediate necessity. Do you support the appointment that was made or do you think the position should have been filled via the normal April elections? Make sure you mark your calendar as this will be a great meeting and one you will not want to miss! Gregory Maichack will present a hands-on workshop at the Bridgewater Public Library on Tuesday September 15, 2009 from 5 p.m. to 7 p.m. The program is offered to adults, age 16 and over. Gregory is an award winning portraitist and painter who works primarily in pastels. He graduated from Holy Cross with a BS in Experimental Psychology in 1974. He also took his first art course there in 1970. Since then, he has trained with such notables in the field of pastel portraiture as internationally acclaimed Daniel Greene, the Copley Society's Constance Flavell Pratt and Foster Caddell. Mr. Maichack will supply all materials, including pastel paper and pencils. The program is limited to 20 participants; registration began Tuesday August 25th. You may email the Library at bwpl@sailsinc.org or call Mrs. O'Connell in the Reference Department at 508-697-3331. This program is supported in part by a grant from the Bridgewater Cultural Council, a local agency, which is supported by the Massachusetts Cultural Council, a state agency.